Hot on the heels of my post about Tube stations at music arenas, Rihanna took to the London Underground last night to get to her gig at the O2. 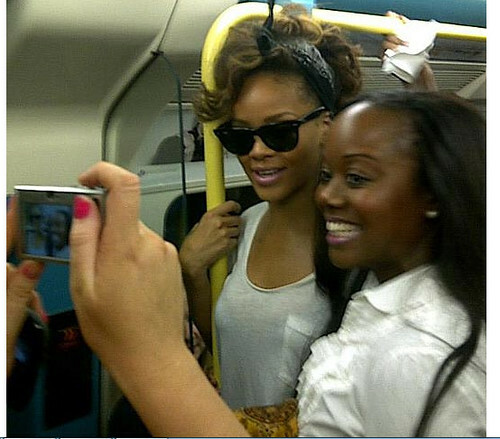 Lisa-Marie O'Keeffe who took the photo said : "I met @Rihanna on my way home, told her she was crazy for taking the tube she said 'Dunno how you guys do it' "
The Sun report "The 23-year-old singer astonished passengers by travelling to London's O2 Arena on the Jubilee underground line using her Oyster travel card. Shocked fans, who the star dubs her "navy", watched as she left a packed Tube train at North Greenwich station." The story is kind of spoilt to hear that when she left the station, with her security guards she then "jumped into a waiting car which drove her just 100 yards to the backstage area of the huge venue". The Sun continued and report that a source said: "Fans couldn't believe they were sharing a carriage with a world famous pop star. "She was just like any other passenger, except accompanied by a huge entourage. She was happy to pose for snaps and talk about the gig. She was so down to earth." 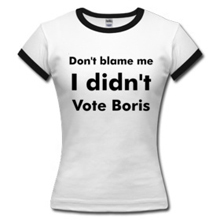 Have you seen anyone famous on the Tube lately?